Like most areas in the Greater Toronto Area, Brampton mortgage rates are very competitive thanks to high mortgage values and a crowded market. 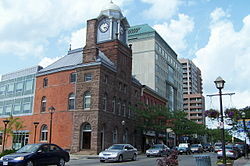 What follows are the lowest rates from providers with offices in or near Brampton. For mortgages in surrounding areas check the best rates in Ontario. City in Brief: Brampton is a diverse and cosmopolitan suburb of the Greater Toronto and as of 2011 was the 9th most populous and second-fastest growing city in Canada. It was once known as The Flower Town of Canada thanks to its large greenhouse industry.